The Davos elite may not have liked it, but the viral video has made Bregman this week’s folk hero and has raised the public profile of Bregman, who was already a rising star in academia. On the back of the Davos video, and articles I later read, I bought Rutger Bregman’s book Utopia for Realists: And How We Can Get There to see what else he had to say about the state of the world. For Bregman, we’re lacking a mighty dose of imagination, funneling our best minds into sectors like finance where they move money around, contributing very little to the betterment of society in pursuit of growing the GDP- a useful measurement of a nation’s power at wartime, but a poor barometer of social welfare. Social dysfunction improves under GDP, but for Bregman it’s no great coincidence that the US which has the highest GDP has the highest number of social problems. The things that we would see as social progress, such as cheaper life improving technology, causes the GDP to shrink. Nurses, teachers and social workers who actively contribute to the improvement of society don’t rate highly in terms of GDP. The yardstick our politicians use to measure a country’s wellbeing and progress is not fit for purpose. In Utopia for Realists, Bregman sets out his vision for how we might come closer to a more equal society which would be more like a utopia for everyone: a universal basic income, shorter working week and, radically, open borders. His academic argument for this is strong, but I’d argue that he makes a strong moral argument as well. When the mortality rate for Somalian toddlers is higher than that of frontline US soldiers in the American Civil War, Second World War or the Vietnam War then there’s something seriously wrong with the world and it’s time that lots was done to fix this on a global scale. This is one of those books that I’m going to insist that everyone should read, and I don’t do that often with non-fiction, so add it to your TBR pile now. This entry was posted in Book Reviews and tagged book reviews, books, davos, equality, philosophy, politics, rutger bregman, society, utopia on February 7, 2019 by Siobhan. There was a time when four books in a month wouldn’t have seemed like very much, but these days I’m happy if I manage to read and review a book a week. With age comes realism I guess, on which, I’ve yet to write a review of Utopia for Realists, but I thought it was brilliant and will link a review here when I get a chance. This entry was posted in Reading Round Up and tagged book reviews, book stack, books, January on February 1, 2019 by Siobhan. I don’t normally review non-fiction that I haven’t chosen for myself, but when I had a query as to whether I’d be interested in reviewing Am I Ugly?, a memoir from Michelle Elman, a body positive influencer who goes by the handle @scarrednotscared on Instagram, I signed up because I’ve got a few scars of my own and I wanted to see how Michelle’s experience related to my own. I was nine when I was run over and the accident left me with a fractured skull, broken nose, a badly broken leg and, the jewel in the crown, a full thickness degloving crush injury to my left foot. If you don’t know what that is, don’t google it. I will not accept responsibility for any damage caused to keyboards by you losing your breakfast, regardless of how long it’s been since you ate it. So, in short, a life time of experience with some none too subtle scars and a few prolonged hospital stays. Michelle Elman’s scarring is a result of multiple surgeries to treat hydrocephalus, and the complications that stemmed from earlier surgeries. Her memoir starts with an account of her health rapidly deteriorating at boarding school and the emergency surgeries that soon followed. While the memoir is billed as an account of one woman’s journey to body positivity, and while I’m sure that it was intended as such, for me, the book wasn’t really about the scars as a profound childhood trauma that the author was left to manage without any sort of adequate support. I’d really recommend it to anyone trying to understand how a child might experience a long hospital stay and traumatic illness. Elman has changed a lot of names in the book, including the name of her school (which can be viewed on her LinkedIn profile so isn’t a hugely effective smoke screen) presumably for legal reasons in light of the allegations she makes about her teacher’s failure to safeguard her during her illness and the diet that her house mistress puts her on. Basically, if you were toying with the idea of spending £15,000 per term to outsource your child’s education and wellbeing to an external agency, then this would put you off. The names that she can’t change, however, are those of her parents, and it does leave you wondering what they were thinking sending a young child with such a dangerous condition to boarding school without proper oversight. Rather than rush her immediately to a hospital when realising how ill her daughter has become at boarding school in the UK, her mother makes her feign wellness to fly to a hospital in LA which has previously treated her “because they have her notes”, risking her daughter’s health on the outbound flight. Following a series of surgeries in the US, she is then in hospital in an intensive care unit where she receives limited psychological support and the medical professionals discuss her condition in front of her in a way that seems designed to increase trauma. As soon as she is well enough, she’s shipped off back to boarding school in the UK, where her peer group has dispersed, finding herself isolated from her family who are in Hong Kong, without friends, and mistrustful of the teachers who have previously neglected her wellbeing. I think a lot of how my recovery post-accident was dealt with made a big difference to our experiences and possibly our various perceptions of our scarring. I was carted off to a psychologist to talk about my PTSD pretty much as soon as I was out of hospital, suffering nightmares and squeaking in distress every time I was taken across a road (bit of a low point that). I don’t ever recall feeling especially self-conscious about mine, my frustration with my foot has always been the ongoing pain that it causes and the things that it’s stopped me doing. If I had the option of having my scars disappear, I’d probably keep them because they are a big part of who I am and I probably wouldn’t feel right without them (the underlying bone issues and my ongoing fear of cars though, they can f*** right off…). What I do relate to though is the being told how brave you must be (as if there was a choice but to cope as best you can?) and the expectation that this sets up that you will keep being brave. And that this becomes a role that you have to play. I remember after one of my surgeries the nurse coming to see if I needed painkillers and still feeling okay because the local anaesthetic was still working and my grandmother telling me that it was okay to ask for the painkillers if I needed them, saying, “You don’t have to be brave.” And I fell to pieces, because it upset this whole identity that had been constructed for me in the hospital about being a “brave girl” and a “good patient”. It’s been interesting to see about how Michelle went on to experiment with different kinds of therapy to address her PTSD, and that is something I’d like to learn more about as I’m vaguely aware that’s a journey that I’m still on. I understand that this is intended as a book about physical scars and the bravery that it’s taken to embrace those, but for me, what’s impressive about this book is the emotional and psychological scars that the author has addressed and the strength that it takes to confront those so publicly. Michelle is still so young, so to tackle the issue of undiagnosed PTSD head on is a brave move, and will hopefully raise awareness for the carers of other young people in similar situations. This entry was posted in Book Reviews and tagged beauty, body positivity, book reviews, books, PTSD, scarring, trauma, wellbeing on January 27, 2019 by Siobhan. Last month, after years of resistance, I signed up to Instagram (you can follow me here if you like) and started playing around with Bookstagram. It’s been a pleasant experience and I guess for me has been closer to what blogging was like when I started – a community of bookworms discussing their favourite reads with people from around the world and picking through what they loved and hated about various books. With a little more focus on the images than a traditional blog, but the level of detail and analysis in the microblogging element has pleasantly surprised me. At risk of digression into the world of Bookstagram (best talk about that another time) this is where I came across Girls of Paper and Fire (aff. link) by Natasha Ngan. Lots of people were posting pictures of copies they’d received in the run up to Christmas, the title was intriguing, the cover was cool, I was dealing with a teething baby… reader I treated myself and bought it. Girls of Paper and Fire is set in a fantasy world, which seems to have been inspired by aspects of Imperial China. The society is made up of three castes, paper, steel and demon. The paper caste are humans without demon characteristics, the paper caste have aspects of both human and demon, and the demon caste have animal appearances and incredible strength. The are the elite caste, with paper at the bottom and steel somewhere between the two. Lei is a human girl born to a paper family. Her mother was abducted during a demon raid on her village when she was a child, but otherwise she lives a quiet life in a rural backwater. But people come from miles around to her father’s shop because Lei has unusual eyes, eyes which are bright gold and look like they belong to a demon in her human body. It is these eyes that catch the attention of one of the Emperor’s soldiers, and lead to Lei being kidnapped to become one of his paper girls, a harem of concubines who are selected annually for the “privilege”. Girls of Paper and Fire has been compared to Memoirs of A Geisha, but personally I found this to be a very lazy comparison. I thought it was more reminiscent of (af. link) Empress Orchid by Anchee Min with a girl trying to find her place as the Emperor’s concubine and the perilous, cruel world in which she lived (though maybe it was partly inspired by Journey to the West?). Even so, Girls of Paper and Fire is a more explicitly violent novel than either of these, and leaves the reader under no illusions about the reality of Lei’s life with the threat of violence constantly hanging over her. The trigger warning at the start of the book is both wise and necessary, especially in Young Adult fiction. I didn’t think that the book was exceptionally well written, and found the writing a little jarring at first, though this either improved or became less noticeable as the book went on. Although Lei was the main character, I felt that her character was less well drawn than that of more minor paper girls and I didn’t feel that her thoughts and actions were always credibly linked. Despite this, I thought that the story was original and the concept was well executed, though I assume that Lei’s eyes are some how related to the Moon Goddess alluded to in the book who defeated the God of Knight. I’m guessing that this is a foreshadow of what will happen later in the series, but if so I would have liked to have learned more about what power or ability Lei has that makes her a girl of fire, otherwise Wren would be, for me, the girl of fire, the member of the paper girls who is different for being a Xi warrior. For all her bravery, Lei wasn’t exceptional as a character, but maybe that’s the point. It seems almost obligatory to leave YA novels open for a sequel these days (Girls of Paper and Fire is the first part of a trilogy), but I did think that the ending of the novel was cleverly constructed to leave Lei and Wren breathing a sigh of relief, not appreciating that the word Flight in Lei’s birth blessing pendant may well be hinting that she will spend the rest of her life on the run from the Demon Bull King Emperor. This entry was posted in Book Reviews and tagged book reviews, books, LGBT, Natasha Ngan, young adult on December 21, 2018 by Siobhan. At the opening of Jenni Fagan’s debut novel, fifteen year old Anais Hendricks, the anti-hero of the piece, is sitting hand cuffed in the back of a police car being transferred to The Panopticon a children’s unit with a watchtower that forces its residents to live under constant observation. She has blood on her school uniform, and a police woman is lying in a coma that she is unlikely to come out of. The opening of the novel, coupled with the fact that Anais is feisty, intelligent and stylish, seemingly possessed of a six sense which allows her to see to the very core of people, could make this sound like a middle of the road, young adult dystopian novel. This couldn’t be further from the truth. Because beneath her tough exterior, Anais is incredibly vulnerable, a teenage girl for whom the label at risk might have been invented- in the grip of delusions fuelled by narcotic psychosis or untreated borderline personality disorder, she has been exploited or failed by most of the adults she has encountered in her short life. This is not a novel which uses a dystopia as a smoke screen for real world issues, this is a novel about real world issues which hammers home the appalling ways that the most vulnerable members of society are so often failed and demonized. Jenni Fagan’s writing is like slam poetry, the perfect words chosen with flair that punches you in the guts. Her characterisation is exemplary and nothing I can say will do it justice, so what I will say is that The Panopticon is a novel which probably needs a thousand trigger warnings, but I would recommend that everyone reads it. This entry was posted in Book Reviews and tagged book reviews, books, mental health on May 12, 2017 by Siobhan. 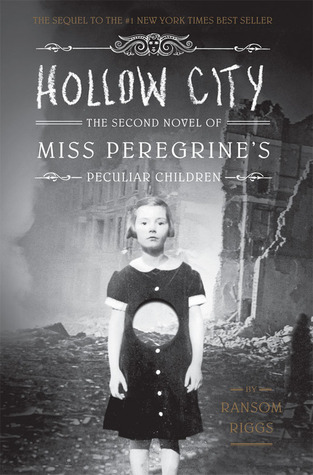 Retaining the high production values of the first book in the series, Hollow City by Ransom Riggs is a stylish follow-up to Miss Peregrine’s Home for Peculiar Children. Following on where the first book left off, it sees Jacob Portman and his peculiar friends running for their lives from the wights and hollowgasts that are pursuing them. Their fight for survival becomes a race against time when they realise that their injured headmistress, an ymbryne trapped in bird form, is at risk of losing her humanity for ever unless they can find another ymbryne to save her within two days. Though it retains the style and charm of the first book in the series, there were times when I became a little frustrated with aspects of the characterisation. Many of the peculiar children have been living the same day since the Second World War, which would easily make them in their 70s, but their emotional responses to many of the situations in the book make them seem like ordinary children. I can appreciate that a lot of the tension derives from this, but at times I felt the children’s emotional vulnerability was played on a little too much. Even if you have grown up in an incredibly sheltered manner, surely you have to some extent grown up? Either way, it’s a minor criticism and the book should be praised for its originality and flair. There are some brilliant moments where minor characters in the plot of the story like Olive’s friend Jessica, or Sam and Elsa, steal the scene completely. The idea of time travelling within the loops is a great one as well, and the examples of people aging forward are horrible and highly effective. I only wish there’d been a little time to explore the landscapes that the characters travelled to within the loops in a little more detail, as this was a real strength of the first title in the series. I’ve no idea when the third book is due, but I’m really looking forward to it. I only hope I get to read it before the rumoured Tim Burton film adaptation comes out. This entry was posted in Book Reviews and tagged art, book reviews, books, film, photography on March 13, 2014 by Siobhan. Have you ever read a book that you can feel is soaring way over your head, but you’ve loved it anyway? 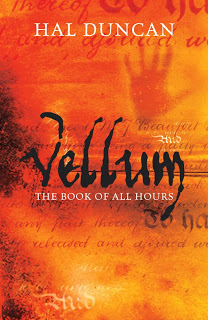 I just had one of those moments reading Vellum by Hal Duncan from The Book of All Hours series. Fragmented, erratic and brilliant, it flips forward and shuffles back through time to narrate the gathering of the unkin, angels and demons, as they fight for the rule of the Vellum, an infinite universe of which the world we know is a tiny fragment. Twisting through time and across multiverses, characters’ lives are revealed to have extended beyond the borders of a typical human span, linked to archetypes dating back to classical myth and ancient Sumer. It’s incredibly clever, like a cyberpunk epic sprung from the dust of ancient myths (though apparently the correct generic categorisation for that is New Weird, you learn something new every day…) and while you do need to pay attention to fully keep a grip on the novel’s ambitious scope, it’s certainly worth it. I just need to dig out a copy of the follow-up, Ink. This entry was posted in Book Reviews and tagged book reviews, books, entertainment on March 11, 2014 by Siobhan.